"Your Projects - Powered by Peace of Mind." Custom Automated Controls (CAC) is a premier provider of specialty electrical and instrumentation (E&I) services for process industries throughout the country. 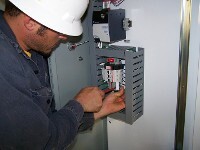 We are a group of highly tenured project managers, field supervisors and craftsmen who share the philosophy that power distribution, process control and safety control systems should be installed and maintained by experienced specialty contractors. All projects are managed using sophisticated scheduling and productivity tools developed by us through years of experience. We have completed a myriad of complex projects in a variety of industries and we are dedicated to completing your work on time, on budget and with a firm resolve for safety of personnel, equipment and the environment. With a magnitude of experience in this specialty trade, CAC has the knowledge and skill to install your intrumentation and pneumatic sytems. Controls, valves and instrumentaion will be installed neatly and functionaly, to provide you the results you expect on your project..
CAC has the capacity to fabricate or build panel projects from client-furnished documentation. Whether it’s pneumatic, hydraulic, electronic or a combination of systems, CAC has qualified personnel to handle the fabrication project.